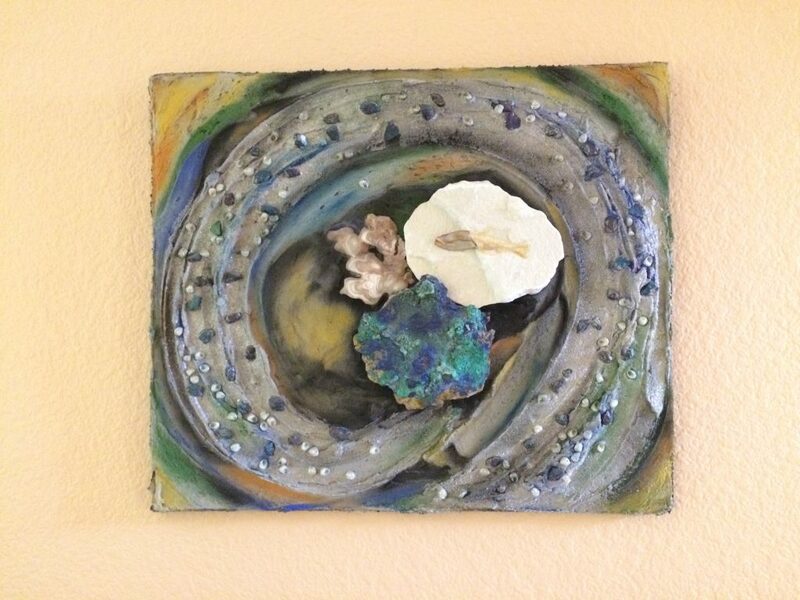 Last month, while enjoying a breakfast crepe at a Jewish deli in Silver City, New Mexico, a mixed media piece of art by Jo Thomas titled Fish Fossil Swirl caught my eye. A blank wall in my Arizona house received this gem with joy. What speaks to my soul about this artwork is the murky depth of the water, the frenetic whirl of sparkly seaside treasures, and the ancient fish, half-hidden, pearlescent, and still. I see my life in the swirl, but my eyes always return to the fish that seems to be anchored in time and eternity. We are ending our fall/winter stay in Arizona and heading for our spring/summer residence in California. In my rearview mirror–treasured friends in the Southwest, the choir at Christ Presbyterian Church in Goodyear that sustains my soul, and the West Valley Writers Critique Group in Avondale that I have come to depend on to help my writing mature. Up ahead, my Evangelical Free Church family, Pine Mountain Lake community, and the Sonora Writers Group that connects me to writers throughout the Gold Country. Also, a visit our daughter and grandchildren on Bainbridge Island and some time on the coast with our son. I try to think of myself as a gypsy who travels light, carries only the essentials, and maintains the same disciplined routine wherever. Ha! I lose weeks of writing time on both ends. But sometimes you have to live in the disruptive moments that life hands you. As we left Silver City to return to Surprise, AZ, we had a close call with death. We were turning off a stretch of middle-of-nowhere road when a car traveling eighty miles per hour swerved to miss us, lost control, and crashed into a road bank. I watched the SUV roll in slow motion. I swear that angels controlled the trajectory of that car because while I dialed 911, my husband pulled a pregnant woman and her eight-year-old daughter from the vehicle. They were unhurt. About the time that we recovered from that experience, a friend and neighbor we had been watching out for passed away in his home. We had an ear tuned to his comings and going. One day, we didn’t see his garage door go up. We didn’t hear his dogs. My husband, who had access to the house, found his body. Blessedly, our desperately ill neighbor is no longer in pain. Also, the dogs he loved got adopted within two days. These experiences remain with us as we pack to leave. Dark realities often disrupt our plans, but providence restores our hope. We are lost in a dangerous world, but found in the love of a friend, a neighbor, a passer-by, and most of all, a God who supplies our needs. This collage reminds me of the teeming life that swirls around us. A young mother lives to deliver her child. A suffering man comes to the end of his earthly life. People step up to help and to care. We move through murky waters, terrified by darkness, uplifted by beauty. And half-hidden in the midst of chaos, an undisturbed Presence invites us to pay attention to what really matters. Wow – once again, well-written words about life – and death, to ponder! Thanks for sharing your thoughts and your life!